Your gutters are designed to safely carry rainwater and melted snow from your roof to your downspouts, keeping water away from your home’s foundation. Leaking gutters and improper water drainage may lead to a variety of serious issues. Reliabuild has found the solution for gutter protection by installing the T-Rex® from Alu-Rex, an innovative gutter maintenance system with a continuous hanger designed to keep your gutters straight and clean for years to come. It mounts your rain gutters solidly on your home, making them much sturdier and more long-lasting that those mounted with spikes and hangers spaced at intervals. There are no weak points. It can support the weight of snow, ice and ladder. It keeps snow out of eavestroughs, eliminating the risk of warping due to freezing and thawing. 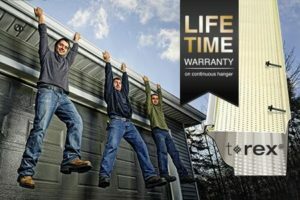 The T-Rex continuous hanger is covered by a lifetime warranty on its sturdiness. A continuous hanger system will extend the life of your gutters by making them stronger, from end to end, while enhancing the exterior appeal of home! Call or email us today. One of our qualified contractors will be happy to meet with you.